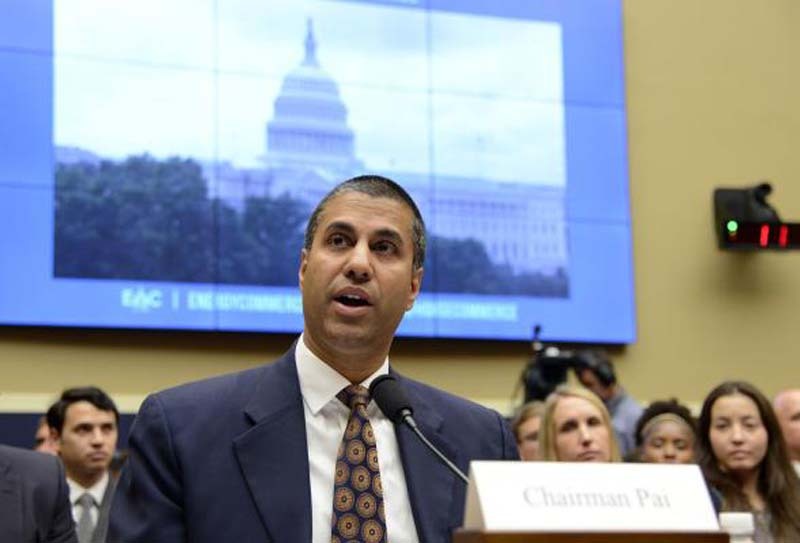 Federal Communications Commission Chairman Ajit Pai on Wednesday reaffirmed his decision to refer Sinclair Broadcast Group's $3.9 billion merger with Tribune Media to a an administrative law judge for review. During a House oversight hearing, congressmen asked Pai to respond to a tweet by President Donald Trump criticizing the move. "I stand by our decision," Pai told members of the House Energy and Commerce Committee. Trump panned the decision Tuesday, lamenting the nullification of the merger between the two media entities. [post_ads]"So sad and unfair that the FCC wouldn't approve the Sinclair Broadcast merger with Tribune. This would have been a great and much needed Conservative voice for and of the People," Trump wrote on Twitter. "Liberal Fake News NBC and Comcast gets approved, much bigger, but not Sinclair. Disgraceful!" During the hearing, the committee's ranking Democrat, Rep. Frank Pallone of New Jersey expressed concern that Trump was seeking to sway the FCC's decision through his tweet. "The only thing that I find disgraceful is the president is still trying to undermine the integrity of dedicated journalists while blatantly trying to enrich his friends and amplify his message at the expense of local news around the country," Pallone said. Pai went on to say he made the decision by examining the facts of the case and not based on the ideological stance of the companies. "The decisions I've made haven't always been easy," Pai said. "But so long as I have the privilege of serving as the chairman of the FCC, I'm going to find the facts, I'm going to follow the law and I'm going to call them like I see them." The $3.9 billion acquisition was announced in May after Sinclair won the rights to Tribune Media in an auction. Sinclair will have ownership or control of television stations in 72 percent of U.S. markets, including in major markets such as New York, Chicago and Miami, as well as 28 percent of Fox Broadcasting's affiliates if the merger is approved. An FCC ruling in April -- which allowed owners of ultra high frequency stations to count the stations' coverage at a reduced rate to comply with a 39 percent nationwide coverage cap set by Congress -- facilitated the acquisition.